At BestPack we provide full vending & coffee services to any types of location including: hotels, schools, malls, apartments, factories, retail stores, offices and more. Click here for comprehensive video of complete services. Companies and organizations benefit from BestPack's in-depth COMPLETE SERVICE. We have real people providing real services 24/7. 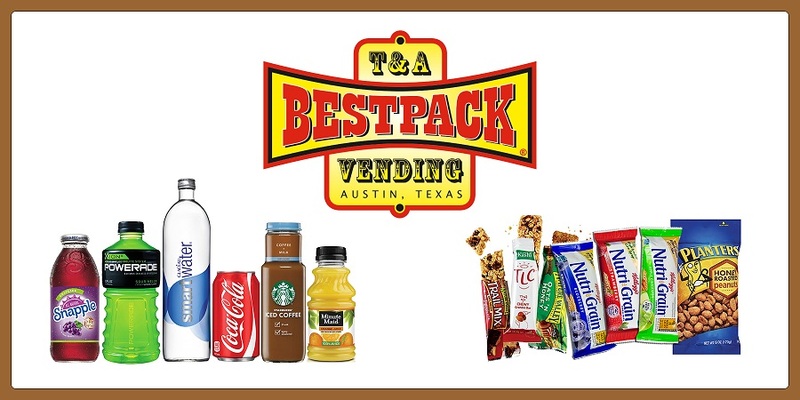 BestPack Vending Solutions can supply your every vending & coffee needs. Our professionals install all of the vending & coffee equipment. Additionally we make sure to keep you stocked with your favorite products. We also handle all the service/maintenance of the equipment, so you can have peace of mind. BestPack has years of experience refreshing people in the Austin area just like you. Leave the details to us today and we will be refreshing your tomorrows... it's refershingly simple. BestPack stocks and distributes the top nationally recognized brands on the market today. We track buyer trends and keep on top of what customers want. Customer requests are welcome, and an entire refreshment program can be customized just for you. Give us a call or email us & tell us your needs! Let us know when & where! Copyright © 2007-2017 Ty Wells. All rights reserved.